“The purpose of the Census is to serve as a nonpartisan instrument to gain an accurate count and understanding of American society every ten years. As we have said before, the inclusion of a citizenship question is unnecessary, unsupported, and a clear attack on the immigrant community. Its inclusion will make people afraid to fill out the form, undermine the count, raise costs, and have a detrimental effect on the distribution of formula funding. As a result, states will receive less funding for education, infrastructure and other important services. This question has no place in the Census and no taxpayer money should be used for a question that will ultimately hinder localities from accessing the resources that they need to serve the American people. The amendment we introduced today is one of many bipartisan efforts to prevent it from being ultimately included in the final form,” said Congressman Serrano. Also last week, Congressman Serrano successfully included language in the Committee Report for the Energy and Water Development Appropriations Bill for fiscal year 2019 urging the Department of Energy to offer technical and other programmatic assistance to Puerto Rico to support investment in innovative energy generation and environment-friendly technologies. The language also encourages the Office of Energy Efficiency and Renewable Energy (EERE) to assess how viable it is to have a subsea electric cable interconnection and to use of micro grids in order to reduce electricity rates. A second report language provision that Congressman Serrano inserted supports the Department of Energy’s involvement in efforts to restore Puerto Rico’s electrical grid, and encourages the agency to continue to assist the island in rebuilding its energy infrastructure. The report language also encourages the Office of Electricity Delivery to collaborate with EERE in assessing how viable it is to have a subsea electric cable interconnection and the use of micro grids in order to reduce electricity rates. “More than eight months after the passage of Hurricanes Irma and Maria, Puerto Rico’s energy infrastructure is remain in shambles and many on the island still lack reliable access to electricity. This language will help ensure the territorial government has the federal assistance it needs to rebuild its energy infrastructure, fully restore energy, and assess the viability of new technologies to reduce electricity rates for consumers. As I’ve said time and time again, when it comes to the allocation of our government resources and access to government programs, territories like Puerto Rico get the short end of the stick. I’m proud to once again work to help the government and the people of Puerto Rico access the assistance they need to continue recovering in the aftermath of hurricane Maria,” said Congressman Serrano. Congressman Serrano welcomed students from the Bronx Community Charter School to the discuss work he does in Washington D.C. and to learn more about the students’ activist work in the Bronx. Congressman Serrano has welcomed students from Bronx Community Charter School and other schools in the past and looks forward to continue to engage with the district's youth. Congressman Serrano met with John Calvelli, the Executive Vice President for Public Affairs of the Wildlife Conservation Society, Jim Breheny, the Director of the Bronx Zoo and Executive Vice President & General Director for the Zoos and Aquarium and their youth ambassadors discuss the role of zoos and aquariums in international conservation and federal programs that support their work. Congressman Serrano is a proud supporter of the conservation efforts of the Wildlife Conservation Society in the Bronx Zoo and has helped secure millions in funding throughout the years for their conservation and animal welfare efforts. 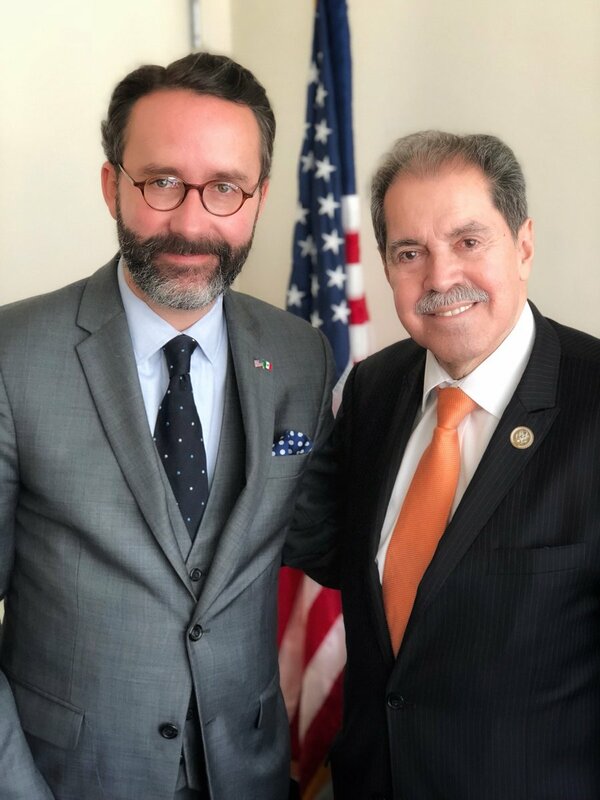 This past week Congressman Serrano met with Consul General Diego Gomez Pickering from the Consulate General of Mexico in New York to discuss topics that affect both of countries, including the growing Mexican population in the Bronx and New York City, DACA, and NAFTA. Congressman Serrano has been a longtime advocate of immigration reform and a finding a solution to fix the status of over 800,000 DACA recipients that currently face an uncertain future due to the Trump Administration's decision to terminate DACA.